Measurements, tips and tricks on setting your dartboard up to regulation specs. You’d be surprised at how many phone calls and emails I get asking me about the measurements and specs for a regulation dart board setup. I always thought the box a dartboard comes in had the specs on it, but who reads directions right? I know I don’t. At any rate I carry a handy measuring chain in my dart case for the simple reason that I setup and maintain dart boards in several sponsoring venues around my area for the dart league, and the chain takes up much less space than my tape measure. Although the specs are easy enough to remember, I thought I’d throw a tutorial out here for those new to the game, or those setting up dart boards in their homes or local pubs. That way I can also address the questions in regards to lighting, hardware and more. Playing darts in a comfortable environment makes a world of difference! Before you start dragging out the tools, consider the area you are looking at for mounting your dart board. Will you have electricity available for good lighting? Will you have at least ten feet from the board to where you will be standing and shooting? Consider the space should you have 2 players, or even 4 if you’re playing teams. 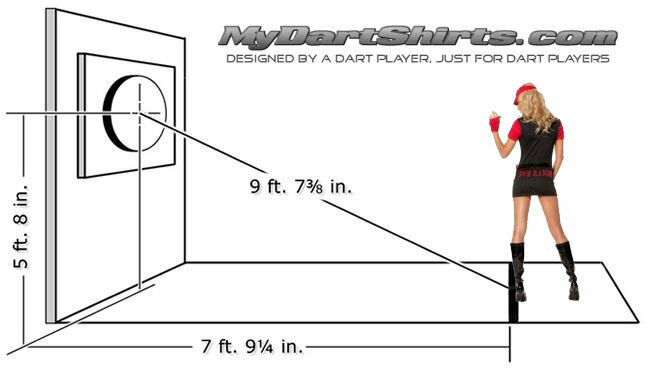 The throw line is almost eight feet from the front of the dartboard (exact measurements will be discussed below), so make sure you aren’t in a tight space or small room where you may be backed up against a wall or some furniture. Lighting is also a critical element. Even in the brightest of indoor spaces, seeing the dartboard clearly can become challenging. I recommend using a separate light or lights for illuminating the board. Track lighting is good, but even a single spot light style can suffice. My preference has become this three light setup I found at Home Depot. I have one setup in my home as well as a few dart bars where I have installed dartboards, and they really do the trick! This particular light leaves no shadows from the wires or darts, as the three spots illuminate the board equally. This 3 spot, halogen light setup is low profile, giving planty of clearance for darts when shooting for tops. It also reduces shadows when mounted within 18 to 24 inches of the dartboard due to the spread on the lights. You might also consider installing a backboard or using a dart cabinet. It’s not all that often that a player will miss the board entirely, however even some of the best can allow one to slip when aiming at a double. You can shop online for a backboard or dart cabinet using the links below, or you can easily build your own backboard that is effective. In my old garage fabricated one using Styrofoam insulation, which I wrapped in felt. I’ve since upgraded to a new Man Cave and a Circumluminator, courtesy of Dartoid. I also built one a while back for a girlfriend out of MDF which I glued a Texas Flag rug on the face for a unique backboard. I had the rug, MDF, contact adhesive and hardware so why not? If you are building one yourself, use creative license and have fun with it! Custom Dart Cabinets – If it’s a dart cabinet you prefer, you MUST check this web site out. I highly recommend it! One thing to consider when setting up your dartboard is an out chart poster. 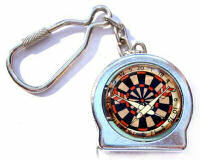 Many dart players have their checkouts memorized and understand the strategy from experience. Novice and beginner players however can learn faster and keep matches moving more quickly by referring to an out chart. Darts Out Chart Posters can be educational to those still memorizing their checkout strategies. At 16 inches wide by 20 inches tall and printed in full color, these out charts are decorative as well as readable from the throw line. Checkouts from 52 to 170, both two and three dart options listed. 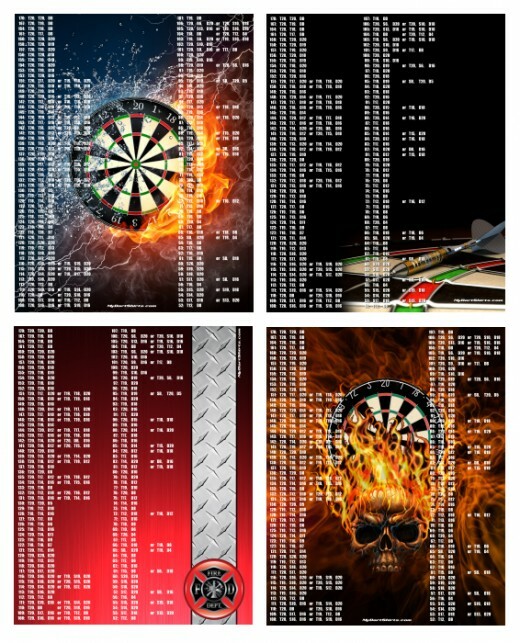 Be the first to be unique with these one of a kind darts out charts! Regulation height for a dartboard is simple. The center of the bullseye is 5′ 8″ from the floor. Using a tape measure – or your wife if she stands 5′ 8″ – mark a spot on the wall or backboard where you will be mounting your dartboard. This will clearly show you where to mount the bracket for hanging the board at regulation height. 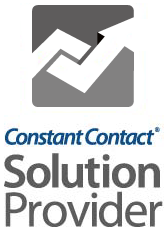 Depending on your mounting surface you might also consider what hardware you may need. If you are using a backboard or cabinet that is mounted securely to the wall, the screws that came with your mounting bracket should do the trick. If you are hanging the board on sheet rock or in an apartment where you want to leave yourself an easy patch up for the day you may move, I recommend going to your local hardware store and purchasing some drywall anchors. The style pictured left are my favorites, as they hold massive amounts of weight and are super easy to use. Your dart board should have a pilot hole pre-drilled on the back directly behind the bullseye, and hopefully came with a screw to install there for hanging on the bracket. 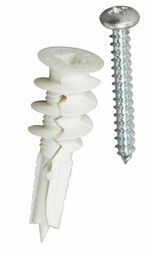 If you do not have a screw, make sure you find one that has a head big enough to grab the bracket securely, and that is not too long as to penetrate all the way through to the sisal where you will be planting darts on the front side of the board. The measurement from the dart board to the throw line (or Oche, pronounced like Hockey without the “H”) can be done one of two ways. The easiest way is to measure 7′ 9 1/4″ from the FACE of the dartboard. This is easily done by taking the measurement from the face of the board to the wall and adding 7′ 9 1/4″ to that measurement. Then take that total, and measuring from the wall you can then place your throw line. You can also measure 9′ 7 3/8″ DIAGONALLY from the bullseye to the front of the throw line. This however requires an extra set of hands. In a pinch, you could cut some string to the length of 9′ 7 3/8″ and hold it in the bullseye with a push pin or a dart. An Interesting Look at Darts History Through Camera Lenses of Days Past. I hope this has benefited dart players somewhere, in some way. I’m happy to share the knowledge, resources and experience! 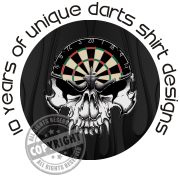 Find even more styles, more designs plus gifts, posters and accessories for dart players at MyDartShirts.com.